Teens attending this Huskie Science Café were fortunate to meet with Charles Fulco. Charles is the NASA Solar System Ambassador who works to educate and motivate the public on the solar eclipse that we are going to witness this year. Our state, Illinois, in particular will have a swath of totality passing through on August 21st of this year! Charles is an excellent outreach coordinator and high school teacher himself. Charles made a special detour in his travels to come back to the Naperville area and share his experiences and enthusiasm about the Totality Event. The presentation was preceded by weeks of publicizing, as our students posted fliers around the school and electronically through our social media outlets. We contacted area high schools and asked them to send ambassadors so that they could witness a Teen Science Café event, and our area astronomy club sent some representatives with telescopes to prepare for the event. 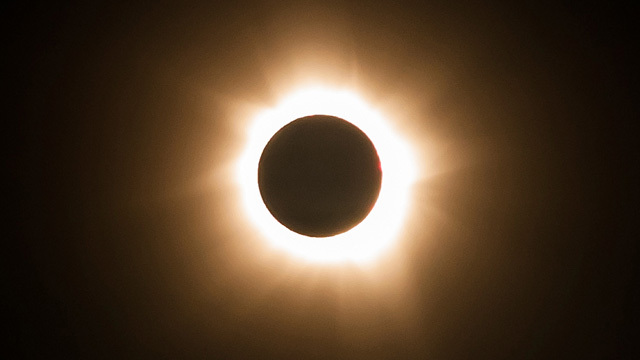 There are many misconceptions concerning solar eclipses, and even in our modern society some myths remain prevalent. For example, there are a number of people who believe that the only safe way to witness a solar eclipse is on television. Charles shared the misconceptions and the truth about solar eclipses with our community during the presentation. We began our event with an opportunity for solar viewing. Unfortunately, the sky was not cooperative, so we moved inside to discuss eclipse science and to have a light dinner with all those in attendance. We started our program with a social event where coffee and hot chocolate were served by our student board members. This was an opportunity for the public to come and meet with Charles. At 6:45 we began our event. Charles showed video clips of Totality events, gave an overview of the event, discussed the Totality site, and described the science that can only be conducted in a moment of totality. We concluded our event at 8:00 p.m. with a question and answer session. During the event we saw upwards of 80 audience participants! Charles ended up staying until nearly 9:00 p.m., speaking with members of our public audience. Charles distributed some solar viewing glasses to a few key members, and we ordered another 300 pairs of viewing glasses that will be handed out to our students and staff to use on the day of the solar eclipse. Viewing a Total Solar Eclipse is a once in a GREAT while opportunity, and Charles did a fantastic job of conveying its beauty and rarity. This TSCN Event was another great experience for our school and our community! ‘Umbraphile’ coming to suburbs to share joys of this summer’s eclipse. Naperville North students get lesson in eclipses. Our hands on activity was looking through solar telescopes, but the weather did not cooperate with us very well.